This textbook is suitable for the following courses: Entrepreneurship, Innovation, and Sustainability. 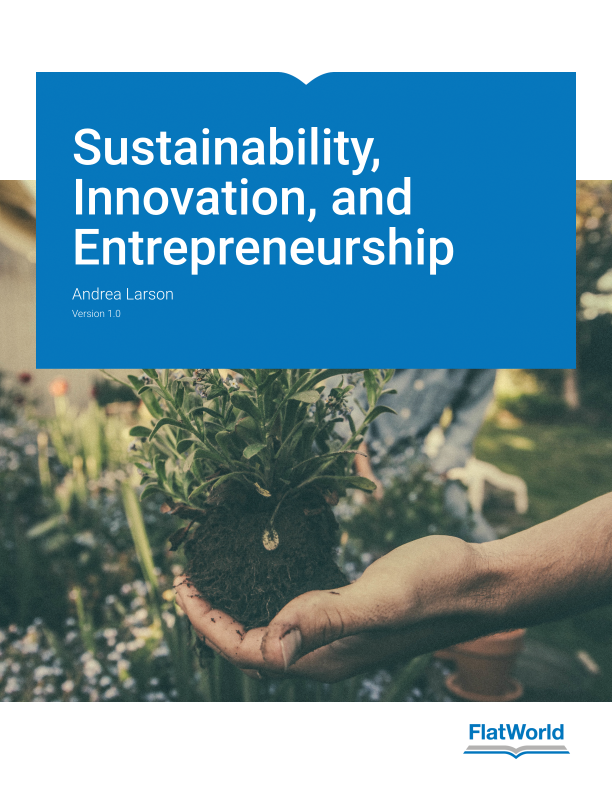 Sustainability, Innovation, and Entrepreneurship offers students and instructors the opportunity to analyze businesses whose products and strategies are designed to offer innovative solutions to some of the twenty-first century’s most difficult societal challenges. Larson presents global ecological and environmental health trends and discusses their implications on today’s businesses. Background educational materials for instructors and students. 7.2 Greening Facilities: Hermes Microtech Inc.
Andrea Larson, Ph.D., is an Associate Professor of Business Administration. She has served for over 20 years on the faculty of The Darden School of Business at the University of Virginia teaching in the MBA program and in Executive Education in the areas of entrepreneurship, strategy, ethics, innovation, and sustainable business. She currently teaches the required MBA elective for students concentrating in sustainability. Professor Larson has taught about entrepreneurship, innovation, and sustainability innovation by invitation at Stanford Graduate School of Business School (2007 and 2010) and the Bainbridge Institute (MBA in Sustainable Business).Her research publications have appeared in journals including Administrative Science Quarterly, The Journal of Business Venturing, Entrepreneurship Theory and Practice, Business Strategy and the Environment, and Interfaces. Her work has also appeared as chapters in edited volumes on sustainability and innovation, green chemistry, ethics, and entrepreneurship. She has produced over 50 teaching materials (cases and background notes) on entrepreneurship and sustainability topics. Larson was co-founder in 2002 of The Ingenuity Project, a multifaceted program to integrate theory and practice on entrepreneurship/innovation together with sustainable business practices, and to encourage their use in management education as well as corporations. Entrepreneurship theory and practice, green chemistry and engineering design, industrial ecology, and cradle to cradle design were illustrative of the core approaches. She has testified before Congress on green innovation as a national strategy and contributed to a National Research Council study of sustainability innovation in the chemical industry. Among her current projects are collaboration on an NSF green building technology innovation study, an interdisciplinary study of sustainable development in Panama, and collaborative work with the Reynolds Program on Social Entrepreneurship at New York University. Prior to starting her academic career, Professor Larson was active in political work, NGO research and lobbying, and served in federal and state government environmental and product safety agencies, thus bringing a rich diversity of sector experience to her current work on private sector innovation. She holds a Ph.D. from Harvard University.